NAZA TTDI Sdn Bhd says the 202.34ha it has in the Klang Valley has a total of about RM8 billion in gross development value (GDV) and is looking to increase its landbank to undertake more niche projects. Naza TTDI also expects its latest upmarket project launched in Ampang on Saturday to rake in RM360 million in GDV. The project joins other niche developments by Naza TTDI such as the RM4 billion Platinum Park at the Kuala Lumpur City Centre, Laman Seri in Shah Alam and TTDI Plaza in Taman Tun Dr Ismail. "Our landbank is small. We have plots of land in Taman Tun Dr Ismail in Kuala Lumpur and Shah Alam, among others. We want to buy more in the Klang Valley," managing director SM Faliq SM Nasimuddin said at the launch of The Valley TTDI, Ampang. The Valley TTDI, which boasts units priced from RM2.67 million to RM5 million onwards each, has been warmly received. Half of the total 134 units of link villas and bungalows have been sold. Faliq expects the sales rate to hit at least 80 per cent by year-end. There are 66 units of seven-room link villas priced at RM2.67 million onwards and another 56 units of eight-room bungalows costing RM2.97 million onwards. If the eight-room bungalows are not premium enough, there are 12 units of "exclusive" bungalows that cost over RM5 million each. Nine units had been snapped up, company officials said. The "exclusive" bungalows sit on 7,000 sq ft each and have 10 rooms with internal lifts and a swimming pool, bringing the total built-up area to 8,412 sq ft. The Valley TTDI itself is located on a 14.36ha site. It will also have a broadband-enabled central community centre and park amenities such as a jogging track, waterfront decks, meditation garden and spring water spa. "The Valley TTDI was designed to personify living harmony with nature. Another unique selling point is its relative short distance to the Kuala Lumpur city centre," Faliq said. The Valley TTDI is targeted for completion in July 2010. Conditions in the Klang Valley's property market remain challenging, according to a property market report from global estate agent DTZ. DTZ said the office property sector faces downward pressure on rental and capital values due to weak demand and the new supply that will be completed in the next few years. In the second half of the year, there is an impending supply of some 3.43 million sq ft in Kuala Lumpur. DTZ said the downward trend may, however, be cushioned by the government's recent liberalisation on economic policies targeting the services and financial sectors. "The relaxation in policies is expected to promote foreign direct investment, with more foreign interests in the commercial property sector specifically," it said in its DTZ Research Report, Malaysia Property Times Q2 2009, released yesterday. 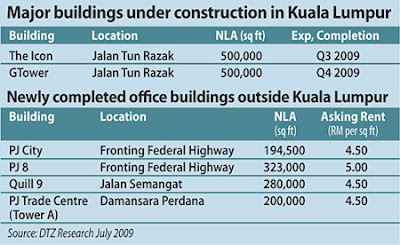 Nevertheless, rents of prime office space in Q2 2009 remained unchanged at an average of RM6.14 per sq ft per month. This is attributed mainly to the fact that there was no new completion of office space in the city centre, and most of the prime office buildings were close to full occupancy at the time of review. On the retail front, DTZ said there was no significant change in occupancy of existing shopping centres as at end Q2 2009, which remained at above 90 per cent. But prospects for the retail property sector are expected to be weighed down by the continued contraction in the economy, which is forecast to recover only in the fourth quarter of this year. "Rents in prime shopping centres remained stable as they are less vulnerable to the economic slowdown. "However, new and upcoming centres that are currently under construction are expected to experience downward pressure in targeted rents in their efforts to build occupancy up to a higher level," it said. "With the oversupply of retail malls in the market, it will be a testing time for shopping malls, especially those in the secondary area with poor population catchments," it added. Meanwhile, the residential property sector would be challenging over the next six months as any improvement in the economic situation is not expected until the fourth quarter of this year. "Prices continued to undergo corrections and are expected to continue softening in the short term in view of impending new supply and weak economic conditions," it said. Generally, prices of high-end condominiums in the Kuala Lumpur City Centre (KLCC) area have dropped by 20 per cent year-on-year. Average rents of high-end condominiums in the KLCC area increased by 6.5 per cent quarter-on-quarter to RM4.08 per sq ft per month. However, the rental market is expected to face downward pressure as a result of incoming massive supply of condominium units in and outside the city centre during the second half of this year and towards the early part of 2010. DTZ said on a positive note, the recently announced overhaul in economic policies, particularly on the repeal of the foreign investment committee's approval for property transactions involving foreigners, would boost interest from foreigners in the local property market, specifically on the high-end residential segment. In terms of selling and buying of commercial properties on the market, DTZ revealed that there were only two major transactions in the second quarter, of which one is between related parties. "There are still some investors out in the market looking for commercial properties with investment value. "Over the next six months, sentiment is likely to recover with some investment activities by opportunistic funds but this will be selective and driven by value hunting," it added. JOHOR BARU: UM Land Bhd expects to generate RM1.2bil in gross development value from its ongoing mixed property development project Taman Seri Austin near here. The 202.34ha project was launched in July 2005 and is being developed by UM Land wholly owned unit Dynasty View Sdn Bhd. Wong Kuen Kong (right) says the project will keep the company busy for the next eight years. With him is Datuk Abdul Halim Suleiman. Dynasty View general manager Wong Kuen Kong said the project would keep the company busy for the next eight years. Todate, 25% of Taman Seri Austin has been developed with 1,300 units of residential and commercial properties, of which 90% had been sold. 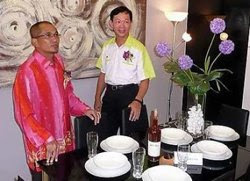 “Upon completion, the scheme will have 5,700 property units and 30,000 residents,” Wong told StarBiz at the launch of 122 double-storey terrace houses on Sunday by Puteri Wangsa assemblyman Datuk Abdul Halim Suleiman. The four-bedroom four-bathroom Deanna II units with a built-up area of 180.88 sq m in a gated and guarded precinct are priced from RM300,048 to RM552,472 each. Wong said although the property market was experiencing a slowdown due to the current economic downturn, demand for houses priced from RM250,000 and above in Johor Baru was still encouraging. Wong said the company always believed that despite the bad times, there were still potential buyers willing to pay more for the medium-high and high-end properties. “Another trend is that customers will only ink the sale and purchase agreement when they see the houses reaching 50% completion,” he said. Wong said when the RM997mil Eastern Dispersal Link Expressway (EDL) was completed by end-2011, it would take only 15 minutes to travel from the Johor Baru city centre to Taman Seri Austin from the current 30 minutes. EDL will link the Sultan Iskandar Customs, Immigration and Quarantine Complex at Bukit Chagar and the North South Expressway via the Pandan Interchange. Wong said the surrounding amenities such as 36-hole golf and country resort, shopping mall, hypermarkets, education facilities and a public hospital were other selling points of the project. PETALING JAYA: TA Enterprise Bhd has proposed to purchase the entire issued shares of Mauritius company Quayside Gem Ltd, which owns Merchant Quay Pte Ltd of Singapore. Merchant Quay is the owner of the 4-star hotel Swissotel Merchant Court Singapore. In a filing with Bursa Malaysia, the company said it had entered into a memorandum of agreement with LaSalle Asia Opportunity II SARL of Centre de Paris to purchase the entire issued shares of Quayside. TA said the purchase would be financed through internally generated funds and external borrowings. TA had paid an earnest deposit of S$5mil, according to the agreement.The company expected to enter into a sale and purchase agreement with LaSalle Asia by Aug 25. The total transaction value for the acquisition was not mentioned in the statement. The company had last December acquired the property and business known as The Westin Melbourne in Australia for RM389.12mil from RPHT Pty Ltd and RPHT Operations Pty Ltd.
TA registered a net profit of RM30.5mil for the first quarter ended April 30. Its revenue dropped 38.1% to RM72mil from RM116.4mil previously. KUALA LUMPUR: GENERAL CORPORATION BHD (GenCorp) is on track to complete the Hard Rock Hotel in Singapore, which is part of the Sentosa integrated hotel and casino resort, by the first quarter of next year. GenCorp executive director Datuk Marco Low said despite the weak global economic conditions, “the owners of the project continue to support the project and are sticking to the date of completion”. GenCorp subsidiary Low Keng Huat (Singapore) Ltd was awarded the S$346 million (RM845.73 million) hotel construction contract in April last year by Resorts World at Sentosa Pte Ltd, a member of Genting International Group. Then the expected completion date for the hotel was by December 2009, but that has since been changed to completion in two phases with phase, one by December 2009 and phase two within the first quarter of 2010. Earlier this month, another casino owner, the Las Vegas Sands group announced the delay in the opening of its US$5.5 billion (RM19.41 billion) Marina Bay Sands hotel and casino resort in Singapore to January or February 2010 from December this year. GenCorp’s other construction project announced at the same time as the The Hard Rock project, the S$146 million construction contract on the additions and alterations to the retail and hotel podium of the Meritus Mandarin Hotel at 333 Orchard Road is expected to be completed by the end of the year. The group, which derived 71.8% of its consolidated revenue of RM766 million for its financial year ended Jan 31, 2009 (FY09) from its Singapore operations, is also working on the S$295 million Serangoon Central Mall to be completed by end-2010. GenCorp, which posted a RM64.93 million net profit in FY09, expects “earnings to be sustained” in the current financial year, said its executive director Michael Chong. He said its 33-storey Panorama freehold luxury condominium project here had seen a 90% take-up rate since its launch in April last year. Construction on the project has started and it will contribute to earnings this year. The Panorama, located near the Corus Hotel, is worth about RM300 million in gross development value and scheduled for completion by end-2010. Malaysian operations are the second-highest contributor to group revenue, after Singapore, making up about 15% in FY09. Going forward, the group plans to develop a 1.6ha (3.95-acre) freehold site in Jalan Conlay here for high-end condominiums. Ongoing projects in Malaysia are the 25-unit “zero lot” bungalows at Taman Esplanad, Bukit Jalil, and 12 semi-detached luxury residences in Jalan U-Thant. The group, which does not have any major landbank in Singapore, undertakes property development in the republic on a joint-venture basis. Its projects include One-North Residences and South Bank. Property developer Metro Kajang Holdings Bhd’ subsidiary Aliran Perkasa Sdn Bhd, plans to buy a 45.4ha plot of land in Semenyih, Selangor, from Bandar Centre Development Sdn Bhd for RM34 million. The group will jointly develop the land with another 8ha land it owns next to it.